The Tanner girls were beautiful. And flawed. As children, the girls were regarded as freaks. They might have been tormented for their singular beauty, but the Tanner girls had special problems. Alice was autistic. Diane inherited her father’s diabetes. Karen was born perfect. But an accident left her with Cerebral Palsy. Specialists advised institutionalizing a child whose physical and intellectual capacities would be painfully limited. The word painful resonated with her parents. They didn’t want their infant daughter to suffer all alone. Better they all suffer together. 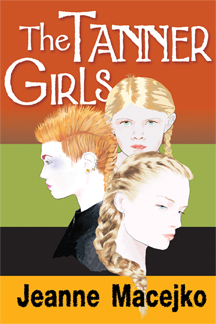 The three sisters, now adults, face their separate futures and a shared past. The Tanner Girls novella is available as a Kindle Single and can be downloaded free from Kobo, iBooks and this website. Karen (Tanner) Erwin is the feisty heroine of the Texas mystery Big D Dead by the same author. Jeanne Ann Macejko lives and writes in Dallas, Texas. She is the author of the mystery novels Big D Dead and Keystone Corpse (a police procedural set in Wales) and has written and illustrated the childrens' books Catching Cold: Agarrando un Resfriado, Dalla Annwyd, A Million Chameleons, and A Million Chameleons: Color Your Own.